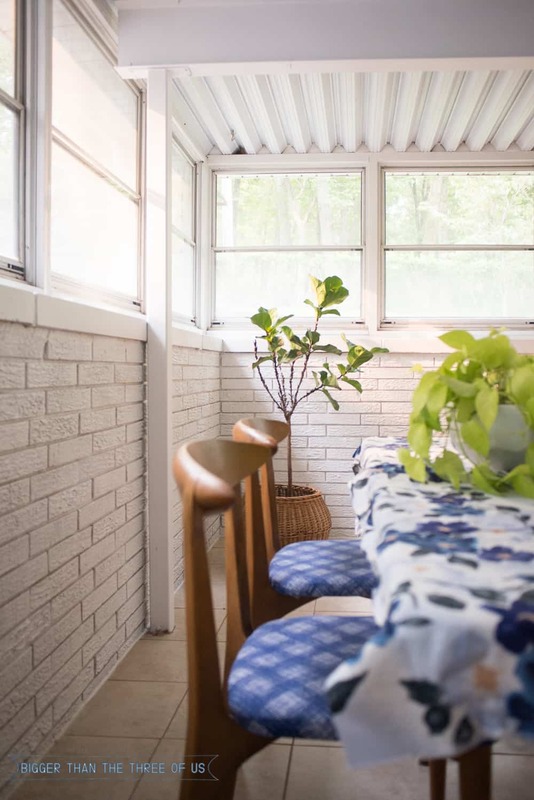 It’s been about a month since the $100 challenge where Luke and I tackled the sunroom. 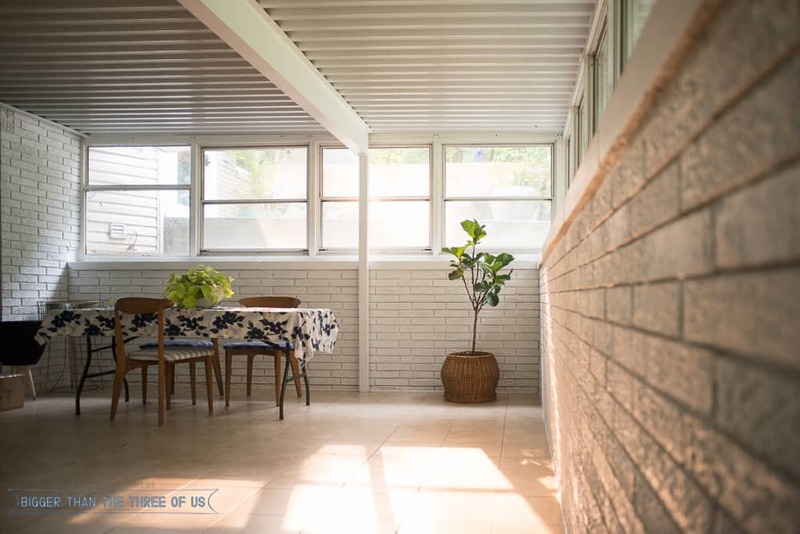 To give you a quick refresher, or in case you are new here, we have a large sunroom. We haven’t been using it for anything other than a graveyard, basically, for furniture that doesn’t have a home; well, that and random decor pieces. 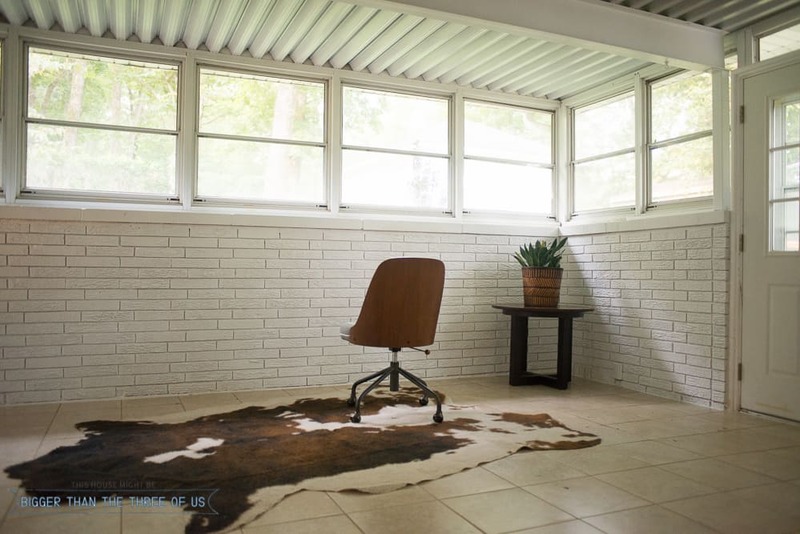 After participating in the $100 challenge, we were able to get the sunroom to a place where I could start thinking about giving the room a purpose. 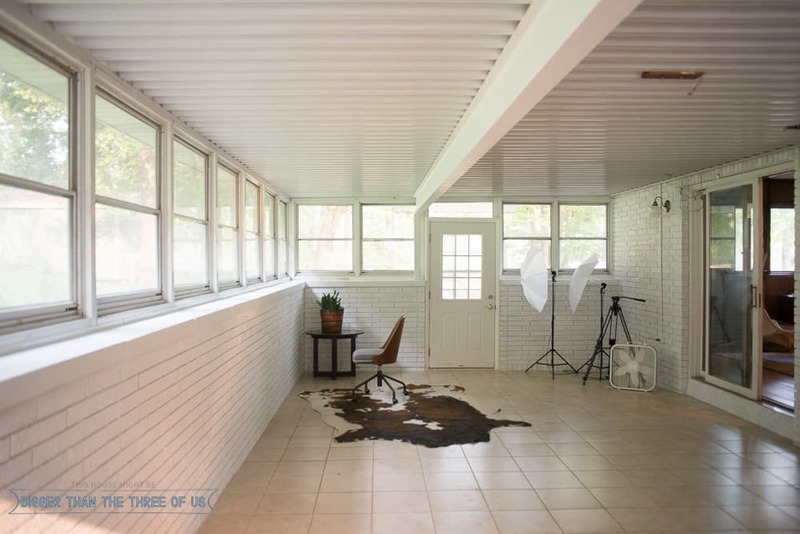 So, let’s chat about turning the Sunroom into an Office Studio. First up, if you want to see the before, progress and where we ended up during the $100 challenge, check out those posts. I still need to share a video tutorial on how to power wash and paint the brick. Sorry for the radio silence on that tutorial but it’s coming soon! Ok, so after living with the space for about a month, we’ve determined that it doesn’t have much (if any) water issues and bugs aren’t going to be a problem. Yay to both of those! I’d been holding out making plans for the space until we saw what types of issues we were going to have with the water/bugs but so far, so good! I’ve slowly started to move a few things into the space that I know I’m going to use. I’ve even set up a few “zones” to work with. Before I show you around and what I think I’m going to do zone-wise, let me just say that I shopped my home with the pieces in this space. They are placeholders until I get more long-term pieces that fit. Ok, so of course my sunroom office studio has to have lots of plants. I brought a few in right away but I know more will migrate to this space. I’d love to have some sort of old farmhouse table in here. I actually have one that I picked up years ago at Goodwill but Greyson has it in his room for a Lego building station. He loves it in there so I’m on the hunt for another one. Right now, this folding table with a scrap piece of fabric will work. The chairs are extra chairs that we’ve just had in the basement. I’m getting ready to do a table switch in our eat-in kitchen and dining room so the chairs will probably be changing out soon. We have some metal chairs upstairs and I think I’m ready for those to get the boot for everyday use. They will probably end up fitting very well in this space though. The table will be used for small craft-type projects (making and photographing them). The rug and the chair represent where my desk and computer will go. I originally thought I wanted it on the wall by the sliding doors but Luke mentioned that I’d have major glare on my screen, and why would I want to face the wall when I could face the backyard. He’s definitely right. In the corner where you see the umbrellas, I’m hoping to do some sort of wall-mounted storage/bookshelves. I can’t take up the whole space because I need some room for my photography stands and things, but I think a bit of cute storage is needed. Above that will be the mini-split. Ok, so onto the plans. Both the short-term and long-term bullets are more renovation-type pieces that will change this space. Decor items and furniture will definitely change the space as well but I’d like to wait a few months to see exactly how much use I get out of the space before I make my mind up on how I want to decorate it. To be honest, the goal for this space is for me to have a designated work space for the blog. I’d “go to work” and then leave work for the day and be done. I think it’s going to be a great thing for us but I don’t want to rush into any decisions quite yet. The only thing I’m looking to buy sooner rather than later are the lights. I’ve rounded up a few affordable (UNDER $75!!) wall sconces. I’ll update you all once we have the mini-split installed. After we get that in, we will move the computer desk and more of the office stuff.